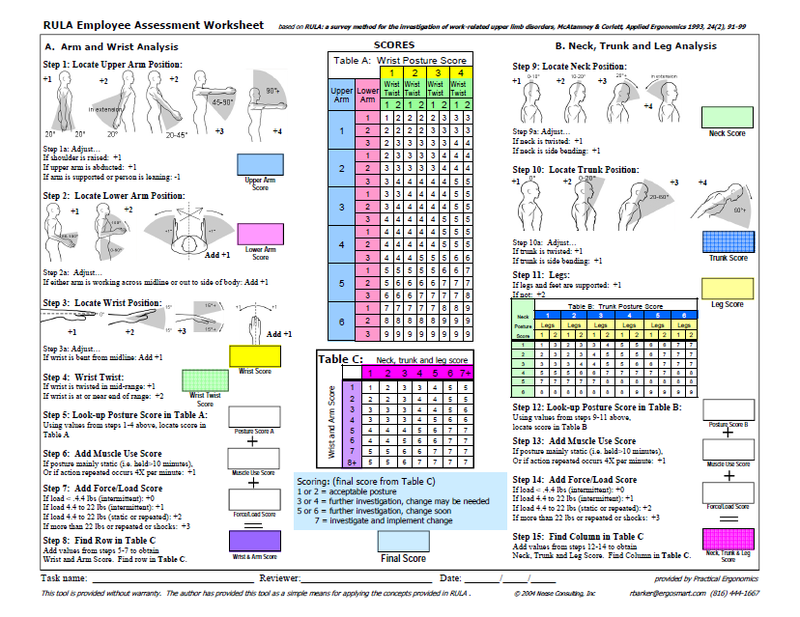 Developed by Mc Atamney in 2005 as a survey method for use in ergonomics investigations of workplaces where work related upper limb disorders are reported. It is aimed to make a rapid assessment on neck and upper limb loading in mainly sedentary tasks. Survey of workplaces where work related upper limb disorders are reported. Positions of individual body segments will be observed and the more there is deviation from the neutral posture the higher will be the score of each body part. The risk is calculated into a score of 1 (low) to 7 (high). RULA demonstrated higher intra-rater reliability than inter-rater reliability although both were moderate to good. RULA was more reliable when used for assessing the older children (8-12 years) than with the younger children (4-7 years). RULA may prove useful as part of an ergonomic assessment, but its level of reliability warrants caution for its sole use when assessing children, and in particular, younger children. Hand burns surface area: A rule of thumb.